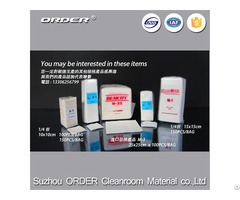 Suzhou ORDER Cleanroom Material Co.,Ltd. 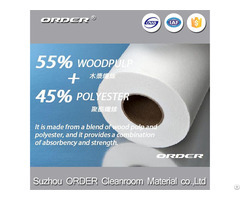 Suzhou Order Cleanroom Material Co., Ltd. Located at Kunshan city ,50kilometers away from Shanghai railway station,Established in 2006. Occupied 8000 square meters.We pass GB/T14001-2008/ISO9001:2008,and our main products owns SGS certificate. 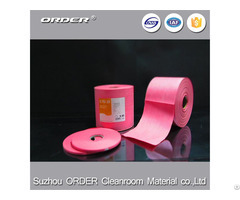 We are a leading manufacturer which is dedicated to manufacturing disposable wipes for Industrial manufacturing, electronic photoelectric industry, household, beauty. Our factory owns six advanced production lines. We combine researching, developing, producing and selling together to satisfy different cleaning demands for different circumstance. Our products can be tailored for demands of clients as flat sheet, folded, pop-up,Jumbo roll, embossed type and so on. Doing OEM/ODM is preferred, we also can supply our registered trade mark “ORDER”.We believe we can be your long term partner, based on our best service, high quality and competitive price.